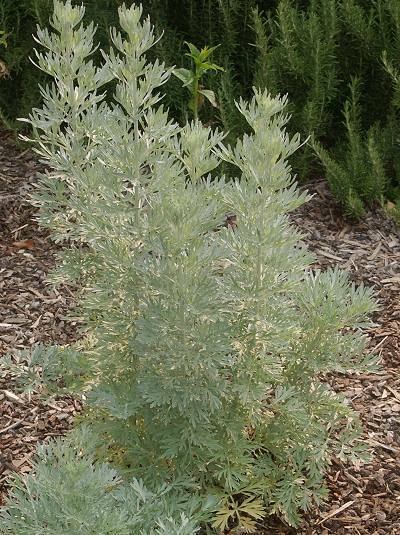 Wormwood is a highly aromatic ornamental herb with soft silvery leaves. Both photos show plants at the same age. However, the top picture shows a Wormwood plant that was chewed off by rabbits twice during the first couple of months of its growth. It never did bloom that year, which is not necessarily a bad thing. The tiny flowers on a Wormwood are not all that spectacular and the elongation of the stems as they go toward bloom makes the plant start to fall apart. So, the rabbit did us a favor by keeping our plants nicely manicured. The second photo shows a Wormwood plant that was left alone and has started to elongate in preparation to bloom. These longer stems make good filler for making our fresh herbal wreaths. Wormwood has been used throughout history for medicinal purposes. But perhaps its most famous contribution to history starts in the late 1700's when it is used as the primary component in the spirit Absinthe. Thought to be highly addictive and psychoactive it was banned in this country from 1913 until 2007. 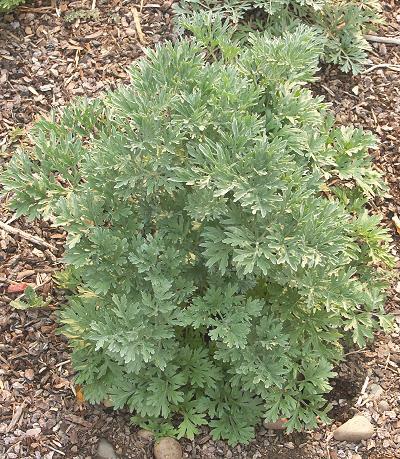 Wormwood is one of the six plants chosen to be in our Crafter's Herb Garden for Zones 5-11.